Apple Suji Kheer & Apple and Ragi halwa are among our most popular recipes for babies with our khichdi recipes. Many readers have written to me to include weaning recipe with banana and rawa, so here we are with banana suji halwa or sheera. This is a perfect weaning recipe for babies around 7-8 months. It is filling and easy to digest. You can also make it smooth or keep a little lumpy. 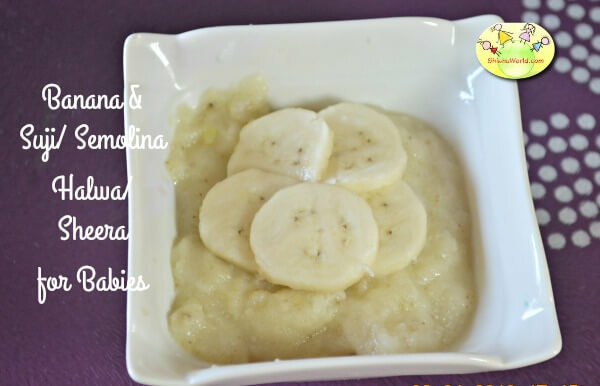 It needs no sugar and still the sweetness of banana makes it a favorite with babies and above all it can be made fresh in just 5-10 minutes. Heat a pan and add 1 tsp ghee to the pan. When the ghee melts, add suji/ raw and roast it while continuously stirring it. After couple of minutes, once the sufi gives out a nice aroma, add hot water to it. Adding hot water ensures there are no lumps. Let is cook for a while. In the meantime, grate or mash the bananas to a smooth consistency. Once the suji has cooked and thickened a bit, reduce the heat and add mashed bananas to it. Close the heat and mix the bananas well with suji. The sheera keeps getting thin as it cools, so do not make it very thick. A yummy meal for your baby is ready just in a few minutes. As your baby grows, you may add a pinch of cardamom powder to the banana sheera/ halwa for a nice taste and aroma. If you feel that the sheera/ halwa is too thick, add a little of warm baby’s milk to adjust the consistency. As your baby turns to a toddler, you may also add a little sugar or jaggery though bananas have enough sweetness. What baby’s milk do you use for a 10 month old? Any formula milk that you are giving to baby or even breastmilk. What is the shelf life of this halwa? This should be made fresh as much as possible, but I guess you could keep it in fridge for a few hours. Can I add breast milk to apple peer reciepy ?? And how to add ?? Yes, you can. Prepare it completely with water. Take off heat and add BM at the end and mix well.